The SANFL IGA League fixture for 2016 is out and there is plenty for Panthers fans to be excited about! As was revealed earlier in the week, we get our 2016 campaign underway with a blockbuster clash against coastal rivals Glenelg at Hickinbotham on Good Friday. We are excited to once again be hosting this exciting initiative and are expecting a great crowd on the day.South supporters will be able to enjoy plenty of local football early as we open the season with three consecutive home games and play five of our first six matches at Hickinbotham Oval. Saturday afternoon football is the prominent theme of our fixture, with 11 of our 18 games being played on a Saturday afternoon 10 at 2:10pm and one at 1:10pm. Overall we play one Friday game, five Sunday games and 11 Saturday games. All but one match is schedule in the 2:10pm timeslot. All Round 22 games have a floating fixture so we will need to wait until later in the year to see when our clash against the Crows will be played. Local products Brad Crabb (150 games), Tarak Redigolo and Jake Veide (100 games) are closing in on significant milestones for the Panthers in 2016, while 2015 Best and Fairest Runner-Up Matt Rose is also on track to play his 100th game of SANFL footy. Meanwhile, we also have plenty of exciting events and initiatives planned for 2016, including; a new Family Fun Day themed Season Launch, Old Skool Round, Community Club Round, celebrating our 140th year as a Club, Gala Night, Member Appreciation Round and much more! So there is plenty to look forward to in 2016. Bring on the season! Good Friday Footy returns to Noarlunga we are looking forward to a big crowd at what has proven to be a favourite fixture for Panthers fans! 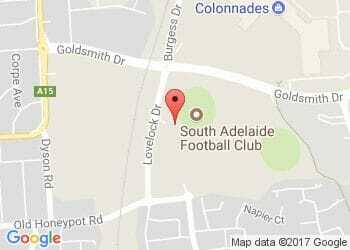 Adelaide Oval State Game South Australia will take on Victoria at Adelaide Oval on Sunday, 29 May. So Panther fans will have the chance to see any South Adelaide players selected don the famous SA colours in 2016! To ensure you don't miss a minute of the action grab your 2016 Panthers Membership today - purchase your membership before December 31 2015 and you'll go into the draw to win a 2015 Indigenous Round Guernsey signed by the whole team!